Throughout our public beta we’ve posted regularly about the services we expect to start using GOV.UK Verify. Our most recent update was in May. Usually we provide a six-month view, with estimated user numbers. Following a recent exercise with a number of departments to identify services that wish to connect to GOV.UK Verify, we’re now able to share a forward look that takes us to live in April 2016, and beyond. The remaining 5 are in private beta with small numbers of invited users. Last month we trialled basic identity accounts with HMRC’s Renew your tax credits public beta service and Apply for the marriage allowance service for invited users. The trial is now over and you can read these posts about the trial and its completion. Those services that are connected or are almost ready to do so are listed in Table 1 below. We are currently working with more than 15 other government services planning to connect to GOV.UK Verify in the next year. These appear in Table 2. There is a further group of approximately 20 services that may adopt GOV.UK Verify over the next year but their planning work is still in an early stage. We’ll tell you more about those services in our next update. This list of services and the estimates of user numbers are subject to change. They’ll be necessarily revised as services move through the various stages of onboarding and we learn more about user demographics and anticipated volumes. A blog about GOV.UK Verify. 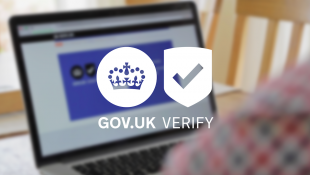 Built and developed by the Government Digital Service, GOV.UK Verify is the new way to prove your identity when using digital government services. Read an introduction to GOV.UK Verify and learn how it works.